Do you enjoy the sound of jazz pianists like Bill Evans? Would you like to go beyond playing rhythm guitar or just playing single note solos? Want to combine melodic soloing and harmonically rich comping chops? Guitarists like Lenny Breau, John Stowell and Lorne Lofsky have developed unique guitar playing styles by taking inspiration from pianists. In this master class, Canadian jazz master Lorne Lofsky will show you how to start thinking out of the box by taking a pianistic approach to both soloing and comping. Lorne will demonstrate how he uses these sounds on jazz blues progression and standards like All The Things You Are and Autumn Leaves. 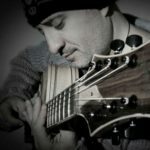 From explaining his approach to using quartal harmony to giving you a wealth of voicing generating practice strategies, this master class will give you a wealth of ideas to take your playing to the next level. Includes a 1 Page of PDF in standard notation. Full video is 1 hour and 34 mins.